NOTE: This service available only to Jet Convert Partners in Australia. Please visit the Jet Convert Partner Program page for more information. Using a standard Chart of Accounts across all your Xero orgs works nicely to streamline your report packs and provide ready comparisons. However getting there can be a pile of work if you import the Chart of Accounts as it is in MYOB and tailor later in Xero. The good news is that the Custom Chart of Accounts premium service enables you to choose how the Chart of Accounts will appear in Xero. The full source file history will then present in Xero as though it had been run through this new Chart of Accounts. The Custom Chart of Accounts service will be automatically added to your chosen package for an additional AU$220. Note, you cannot receive monthly comparatives in conjunction with the custom Chart of Accounts. If you select a premium package, once you have selected the Custom Chart of Accounts service we ask for information on how the bank accounts should be treated in Xero and to map any custom tax codes that may exist in the source file. After a small delay you receive another email asking you to go to the Chart of Accounts mapping screen. How do I perform the Chart of Accounts Mapping step? 1. Create the .csv file that contains your desired Chart of Accounts. The easiest way to do this is to export a .csv file from an existing Xero org which you can then modify. 2. Click on the link in the email you were sent from us which will take you to your conversion status page to perform the mapping. 3. Upload the .csv file you created. 4. Use this screen to map the Chart of Accounts as you would like them in Xero. a) Drag the source Accounts from the left hand column into the Xero destination accounts on the right hand side. b) You can add any accounts that cannot be mapped with a simple drag and drop. They will be added in Xero. c) The accounts highlighted in green have been automapped and you should do a quick check of these. d) You can also change account type and tax rate from this screen. 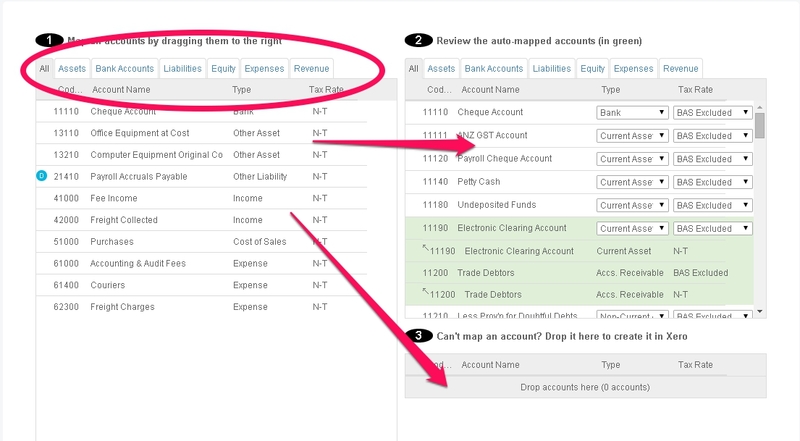 Tip: Use the Tabs at the top to filter the data, making it easier to select the appropriate account to map to. Tip: You can multi-select accounts for mapping by using the “Shift” or “Ctrl” keys when clicking. 5. Click the green ‘Start Conversion’ button and you are on the way. It takes up to 3 business days to complete the conversion from here. we auto-map when the names are similar, these are highlighted in green. The trial balance comparison in the post conversion Action Checklist shows exactly how your accounts have been mapped from old to new, an easy reference guide for your clients. Option 2: Import Report codes – if you have used report codes in another organisation you export and import the report codes. Please see here for assistance. We’d love your feedback on this service, please leave a comment below with your thoughts.